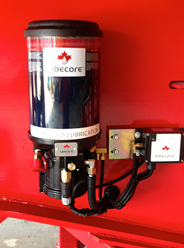 The team at Briskair can now also supply and install the Lubecore automated lubrication system, whilst other work to your truck is done. This system enhances your preventative maintenance program and keeps your greaseable components in excellent condition, resulting in safe and reliable equipment performance. This maintenance improving tool keeps your equipment on the road, earning you money klicking up chargeable kilometers. steering components such as King Pins and ball-joints, Brake S Cam bushings, spring hangers and bushings and the fifth wheel plate, using a standard chassis grease. As Australian conditions are more often classified as “severe” than not: This as a result of our high ambient temperatures, humidity, dust, water crossings whether due to flooding or as a standard part of the trip. Not to mention the loads we haul and the distances we travel. 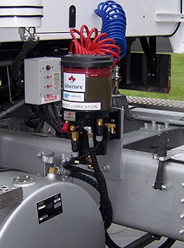 The Lubcore standard chasis EP2 Automated Lubrication system has reportedly saved operators small or large; time, headaches and money by lubricating the truck when it needs it most – and that is whilst the truck is working – without any downtime and/or argument. Automate now call Briskair and we will take care of it. Our system reduces grease consumption by up to 75%. This means less grease ends up in the environment. Saving both money and the environment and as it works with EP-2 standard chassis grease.The system is fully compliant with truck manufacturers and component suppliers Warranty standards and requirements.